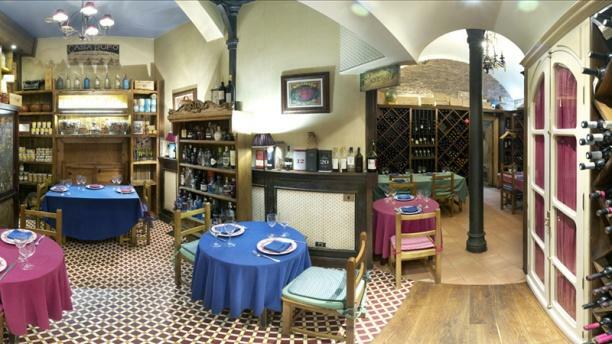 Casa Rufo es un antiguo restaurante especializado en cocina vasca tradicional y avalado con una amplia experiencia, ya que fue fundado en 1902. Los amantes de los licores podrán disfrutar de su colección de gran reserva de brandy y de whisky. En este lugar degustarás la gastronomía típica de esta región, algunos de sus platos más destacados son el estofado de rabo y bacalao al horno, el chuletón de buey a la brasa o las croquetas caseras. Además, no dudes en probar cualquiera de sus postres como el canutillo relleno de queso idiazábal. Se trata de un local con un ambiente muy auténtico en el que se respira un aire encantador. Su decoración es sobria y acogedora para que te sientas cómodo mientras disfrutas de una agradable velada. Fantastic- one of the best steaks we have had. Would definitely recommend it as a go to place. Excellent steak, wine and atmosphere. I highly recommend. Overpriced for what you get... I saw this place had great reviews but I was slightly disappointed. It's a nice, family fun restaurant and the atmosphere is unique, also as if eating in their living room. Fantastic food and atmosphere. Portions are generous. Very good. Good value for money, not cheap, but very good. Horrible experience I don't recommended that place at all. We loved the place, the food and the setting, and can really recommend the place. The starter was cured Duck breast (one dish is enough to share for two), and then we had the traditional basque chuteleta. We tried to different dessert; the house flarne was OK, but the cheese 'pudding' was excellent! Only two things on the down side: the Gin& tonic costed 10€ for a glass, and the waiters were very quiet with absolutely no smalltalk. An incredible experience. Definitely recommend. Steak was superb as was the wine selection. Very friendly and attentive staff. One of the best beef meals ever. Simple food but very well cooked and high quality. Large list of red wines but could not find our first two choices. They recommended another and it was excellent.